For transformer manufacturers, test laboratories, power utilities and others with a need to measure capacitance and dissipation factor at high voltages, Megger's new CDAX 605 test set provides a convenient, cost-effective and versatile solution. Faster and easier to use than even self-balancing capacitance bridges, more versatile and at least as accurate, the innovative CDAX 605 combines an exceptionally wide measuring range with fully automatic operation. Ideally suited for tests on power and instrument transformers, liquid and solid insulation, cables, shunt reactors, capacitors and bushings, the CDAX 605 provides direct readings of capacitance, dissipation factor, inductance and ratio without the need for bridge balancing or calculations. It achieves an accuracy of 0.02% for capacitance over the range 0 to 100 µF, and 0.002% for dissipation factor from 0 to 100. 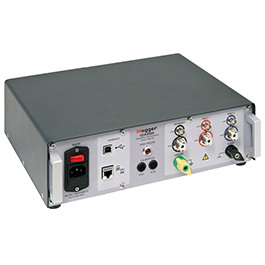 Absolute current and voltage levels are measured with an accuracy of 0.5%. Like a traditional bridge, the CDAX 605 works with an external reference and high-voltage source, but with this innovative instrument, the reference can be either a capacitor or a resistor, and the measurement object can be capacitive, inductive or resistive. This is a significant benefit, as calibrated standard capacitors are typically only available in a limited range of values, which means that with conventional measurement techniques the test current for high ratio devices like capacitive coupled voltage transformers (CCVTs) can be undesirably low. Irrespective of the type and value of the reference used with the CDAX 605, no recalculation of results is needed. Megger's new CDAX 655 high-voltage capacitance and dissipation factor test set features compact yet robust construction, and weighs only 4.4 kg. Despite its small size and weight, however, it accommodates all standard test configurations, including UST-R, UST-B, UST-RB, GST-GND, GSTg-R, GSTg-B and GSTg-RB, with three measurement inputs. Designed for use with an external PC, the CDAX 655 is supplied with software that provides a convenient and intuitive user interface and has integrated data logging facilities. LabView and C# communication interfaces are also available to further increase the versatility of this innovative instrument.